Arrow #SDCC: Laurel's return + Batgirl & the Oracle?! Arrow has been on considerably, unsteady ground with fans following the overly drawn out, and ultimately lackluster, arc featuring Damien Darhk. Having lost Laurel Lance, this year’s trailer at SDCC for the upcoming season, offered little reassurance other than hope that Laurel Lance may return. In the trailer below, it seems Arrow showrunners are taking a ‘go big or go home’ approach to completely revamping the series, in an analogical ballad of “you are not alone” to Oliver. Whilst I was all for character development last season, let’s move forward, shall we? Opening to a pensive Oliver looking upon the uniforms of his old team; his own suit noticeably absent in the lineup, his narration follows. “I know you wouldn’t approve of what I did”; referencing the footage of Darhk’s demise that plays on screen, “I know that it’s not what you would’ve wanted” he continues, as he’s revealed beside Felicity at Laurel’s gravesite. As his confession falls silent on the dead, he ends with, “but you were always better than me”. Growing a little impatient with Oliver’s crawling character progression, his continuous anchor to Laurel and his past; as flashbacks to Oliver’s time in the Russian Bratva, seeks not to only inspire a theme of leadership this season, but in its premise, a revival, of the Archer that survived. With Laurel’s grave far from at peace with Oliver’s inability to let things go, it is with brazen and delusional optimism that I’m willing to tolerate this crawling pace, for Laurel’s revival. In further reference to Laurel, the eagerly anticipated reveal of the promise Oliver made to her on her deathbed, proves to be disappointing as she becomes nothing more (at this point) than a messenger to Oliver’s plight. With no secrets to reviving her (other than her casting across two of The CW’s, DC shows) she instead insists that Oliver not, go it alone. 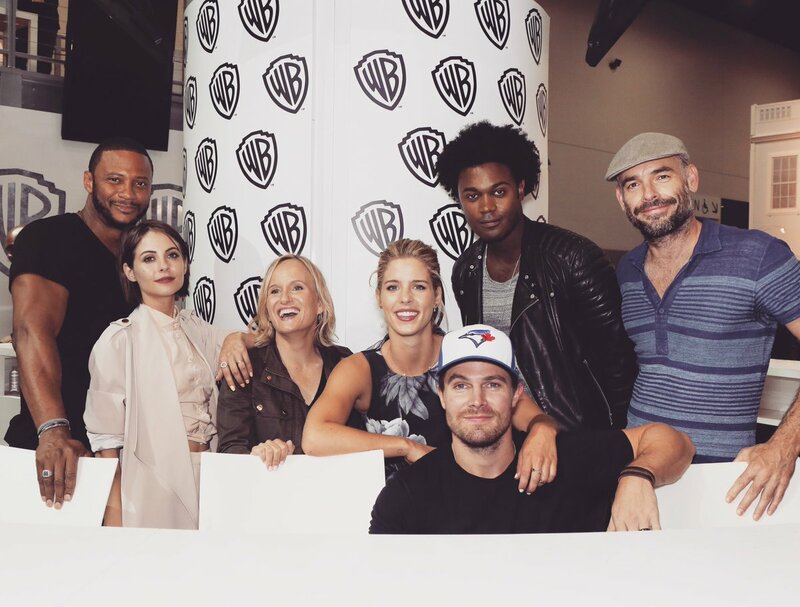 In a move towards something new, Felicity leads the series reboot with the suggestion that they reassemble team Arrow. With Diggle apparently serving in the armed forces, and Thea re-entering society, it is only Felicity and with great satisfaction; a newly vindicated Curtis, willing to join the team. As the recruitment process begins, Fake-Canary Evelyn Sharp makes the team alongside newcomer, Renee Ramirez. Alongside Oliver’s time in the Bratva, Season 5 takes a turn from themes of Fatherhood to leadership and legacy, as he trains his new team and works his way through Bratva hierarchy. Colton Haynes also makes a return, however fleeting it may be, considering his casting in Scream Queens. Also rumoured, is news that Batgirl, the Oracle and Constantine will be taking trips to Star City and other DC/CW shows. Though Constantine is the most likely to return, the CW would be taking on a hefty challenge in pleasing fans, with portraying Batgirl and the Oracle with proper depth; and not as passing plot devices. Permanent visits are far from likely though, unless Arrow wants to address its namesake this year also. Do you welcome change? is any change good, considering the mixed response to recent seasons? or is Arrow headed towards its doom? Whilst Season 5’s new villain, seems to be another Archer, his Zara-esque wardrobe of monochromatic colours and skin clad everything; as opposed to the favoured veil of the league, pays reference to executive producer Marc Guggenheim’s depiction of “a new character, someone who fits into the theme of legacy this year that’s going to be driving all of our characters, including the big bad”. With the mystery behind the upcoming season proving more and more pivotal to fan loyalty this year, here’s hoping our new villain can prove himself a worthy opponent. Arrow returns October 5th at 8|7c on the CW!